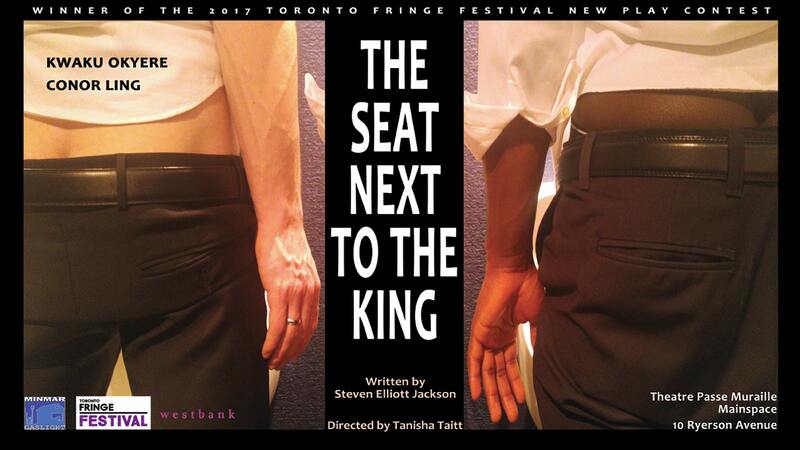 Brilliantly acted by festival breakout Kwaku Okyere and Conor Ling (whom I couldn’t be happier to see back in Toronto after years in the States), the Fringe’s New Play Contest winner is, like many a New Play Contest winner before it, a bit too good for the Fringe. It’s more thoughtfully composed, better rehearsed, and generally feels as though it belongs in a proper season rather than a startup festival. Balanced sturdily on the lightning-in-a-bottle chemistry between the two actors, this hyper-personal allegory for gigantic social issues will make a huge impact when it breaks free of the Fringe and gets the development attention it deserves. There’s a pretty fool-proof way to make a big impact without much effort- pack your stage with tons and tons of people, send them down the aisles, make the audience feel like part of a movement. If those dozens of people on stage can be dancing (ideally well), all the better. It’s the Wexford Gleeks that make these yearly Johnston & Wilde extravaganzas stand out- their untapped talent, their unbridled enthusiasm, the sheer number of them. Unfortunately I can’t credit the standouts beyond “the one who raps” and “the girl who sang the Anne & Gilbert solo” because the program doesn’t credit them but I saw them, and I noted them, so that when they show up on Toronto stages when they’re done with school, I’ll be ready for them. I don’t, however, love that these kids awkwardly share the stage with the established artists who wrote the original music and terrible sketches; I’d rather see them carry the show on their own. Caitlin Robson and Eric Miinch’s realist rom-com starts with a reunion- two people trying to come back together and pretend they never hurt each other, an attempt that fails miserably when Eric tells Caitlin there are certain things they can never do again. She protests that he used to love those things (the issue at hand is ear-licking…?) and his response is the tragic reality the rest of the play tries to explain: “you don’t love me anymore”. We then begin a series of flashbacks to times that were not actually happier, a non-linear trek through a relationship that never worked and can’t possibly work, scenes of hilarious disagreement draped in the tragic knowledge that all involved want so badly for it to work. Stephen Joffe’s new play Letters to Annabelle dances in predictable territory as we follow a returned Canadian soldier (Kyle Bailey) to a shady burlesque club where he’s trying to find the mysterious woman he fell in love with years ago (Anne van Leeuwen) in hopes of sweeping her off her feet and away from this club and its morally questionable owner (Alexander Thomas). To rescue us from the lurking clutches of this passé madonna-whore conundrum, Joffe sends us Maggie May in the form of the captivating Vanessa Trenton. As the stiff and clueless Pt. Liam Crane pines for a transformative woman he’s romanticized, Maggie May emerges as the story’s true protagonist, a tough and clever flesh-and-blood dreamgirl too good for the man she places on the same pedestal where Annabelle sits. Joffe’s script is full of clever twists on old conventions but Yehuda Fisher’s uncreative direction does it no favours with terrible sightlines and painfully long transitions. I’d love to see this show get a second production, not a straight remount. This strange semi-biography of poet Hart Crane sports a bravura performance by Shawn DeSouza-Coelho but lacks coherence and connection. The characters blur together, to say nothing of the events, and it’s never clear why this story is being told right now in this way. Triple threat Jada Rifkin has terrible luck with Fringe scripts; I feel like every single year I write “Jada Rifkin delivers an engaging, energetic performance despite material that gives her little to work with”. Copy and paste, I guess. Contagious is clunky, predictable, awkward, and unintentionally goofy. Jada Rifkin delivers an engaging, energetic performance despite material that gives her little to work with. Somebody please throw Jada Rifkin a bone!